Arbuscular (AM) endomycorrhizas are the most common type of mycorrhizal association, and were probably the first to evolve; the fungi are members of the Glomeromycota (discussed in Chapter 3; CLICK HERE to view page). In other textbooks you may find these fungi placed in the order Glomales and phylum Zygomycota but this is incorrect. AM fungi are obligate biotrophs, and they are associated with roots of about 80% of plant species (that’s equivalent to about two-thirds of all land plants, or around 90% of all vascular plants), including many crop plants. The AM association is endotrophic, and has previously been referred to as a Vesicular-Arbuscular Mycorrhiza (VAM). This name has since been dropped in favour of AM (see Table 2 and Fig. 6 and Fig. 7 in Chapter 3), since members of the family Gigasporaceae do not form vesicles. Fig. 6 illustrates the main features of this type of mycorrhiza. Fig. 6. 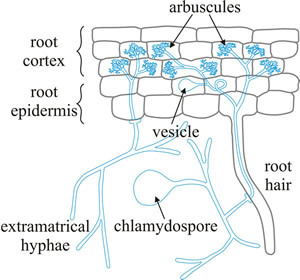 Diagrammatic representation of the main cellular features of the arbuscular endomycorrhiza. Hyphae from a germinating spore infect a root hair and can grow within the root between root cortical cells and also penetrate individual cells, forming arbuscules. These are finely branched clusters of hyphae, which are thought to be the major site of nutrient exchange between fungus and plant (modified from Jackson & Mason, 1984). See Fig. 3.7 for photographs illustrating many of these features and for more information and illustration of mycorrhizas visit Mark Brundrett’s website at http://mycorrhizas.info. There is a wide-ranging fungal mycelium within the host root, and AM fungi explore the soil or other substrata with an extensive extraradical mycelium. Externally to the host the fungal hyphae produce the very large spores (often called chlamydospores). Formation of the mycorrhizal association is an infection process (Fig. 7). Spores germinate near a plant root and the germinating hyphae penetrate the root in response to root exudates. Hyphae grow through the root tissues and in the root cortex hyphal branches form appressoria that penetrate the plant cells. The host plasmalemma invaginates and proliferates around the fungal intrusion. Repeated dichotomous branching of the fungal ‘hypha’ produces the arbuscule (Fig. 6) inside the cortical cell. Arbuscules have a lifespan of 4-15 days, after which they break down, and the plant cell returns to normal. Fig. 7. 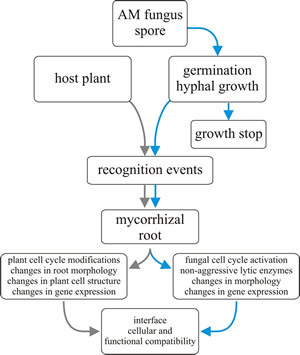 Flow chart for mycorrhizal establishment. Many AM fungi (except the family Gigasporaceae) also produce vesicles within the roots (Fig. 6), either between or within the cortical cells. These are swollen spherical or oval structures containing lipids, which are thought to be used for storage. Vesicles are usually over 100 µm in diameter and are swollen hyphal tips. All AM fungi are obligately biotrophic; that is they are completely dependent on plants for their survival. This does not present a problem for AM fungi, as they show little or no host specificity. Unlike ericoid and orchid mycorrhizas, AM fungi are not restricted to any particular taxonomic group of plants, and are found extensively in pteridophytes, gymnosperms and angiosperms of all habitats and even ‘primitive’ plants such as bryophytes and liverworts form AM-like symbioses. There are between 150 and 200 species currently known, although the taxonomy is still largely based on characteristics of the relatively large (40 to 800 µm diameter) multinucleate spores that are formed on the mycelium external to the host root. Studies using molecular markers have revealed a great deal of diversity suggesting that the number of 200 or so described ‘morphospecies’ might be an underestimate of the true diversity of the phylum (Redecker, 2002). There is no evidence that the Glomeromycota reproduce sexually and it is assumed that the spores are formed asexually. The spores have a layered wall and features of this can be used to describe species. Similarly, spores may be formed singly, in clusters or aggregated in so-called sporocarps and the mode of spore formation has been important in describing genera and families (CLICK HERE for illustration of more of these morphologies). Ten genera are recognised in the Glomeromycota. Glomus, is the largest genus in the phylum, with more than 70 morphospecies (spores, typically with layered wall structure, are formed by budding from a hyphal tip), placed in the Family Glomeraceae, Order Glomerales. Gigaspora and Scutellospora are closely related genera in the family Gigasporaceae; their spores form on a bulbous sporogenous cell and germinate through a newly formed opening in the spore wall; the genus Pacispora is related but separated from these. The family Acaulosporaceae includes the genera Acaulospora and Entrophospora; which are related to Diversispora. Paraglomus (in the Paraglomerales) is ancient, but forms a sister group to the Archaeosporales, which includes the genera Geosiphon and Archaeospora. Geosiphon pyriformis is interesting, as it forms an apparently unique symbiosis with the cyanobacterium Nostoc punctiforme. This is structurally the reverse of the situation found in other AM fungi because the photobionts is harboured in fungal bladders up to 2 mm in size; so in this case the fungus is the macrosymbiont (or exhabitant) and the prokaryotic photosynthetic partner is the microsymbiont or inhabitant. Because AM fungi are obligately biotrophic, attempts to grow them in axenic culture have so far failed; though the spores will germinate in axenic culture, they subsequently die. However, since the majority of commercially grown plants form AM associations, interest in developing ways of inoculating crops with mycorrhizal fungus continues to increase (see below, section on the commercial applications of mycorrhizas). phosphate, mobilised and taken up by the fungal hyphae through their exploration of soil microhabitats. however, although this is a neglected area of research, these mycorrhizas probably also contribute to nitrogen-cycling in the soil (Veresoglou et al., 2012). This two-way exchange of nutrients takes place between the plant root cortical cell and the fungal arbuscule that has penetrated it; this is the symbiotic interface and on the one side it is bordered by the plant plasma membrane and its extracellular matrix, and on the other side by the fungal plasma membrane and its extracellular matrix. Fig. 8. Schematic illustration of a model for the exchange-transfer of phosphate and carbon compounds across the arbuscular mycorrhizal interface. Plasma membrane proton-pump-ATPases and secondary transporters that have been experimentally localised in the membranes of the arbuscular interface are indicated by the circles, with the arrows indicating direction of transport. Redrawn from Ferrol, Barea & Azcón-Aguilar, 2002. Nutrient transfer between fungus and plant is indirectly linked; that is, there is no ‘one-for-one’ linkage between, say, glucose and phosphate exchange. This is indicated by the fact that the same host plant can be in symbiosis with different AM fungi and, when this happens, there can be very different carbohydrate-phosphate exchange ratios between the different plant-fungus pair wise combinations. In addition, carbohydrate transfer can be decoupled from phosphate transfer if the soil has high phosphate availability. 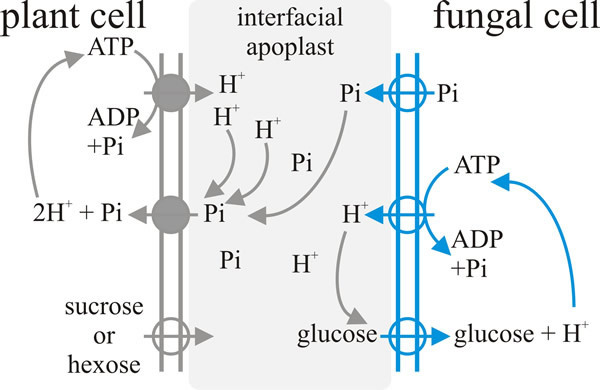 The process of transfer of nutrients between the plant and the fungus is believed to involve passive efflux of solutes from each donor organism into the interfacial apoplast (the apoplast is the free diffusional space between the two, plant and fungal, plasma membranes), followed by active uptake by the receiver organism. All the active transporters that have been implicated so far in this mechanism are proton-pumping ATPase symporters (see the section on The flow of nutrients: transport and translocation in Chapter 10; CLICK HERE to view the page). Specifically: on the fungal side there is an ATPase that pumps protons into the arbuscule at the expense of ATP and simultaneously takes in glucose, and on the plant side there are mycorrhiza-inducible plant phosphate and ammonium transporters in mycorrhizal roots (Fig. 8) (Ferrol et al., 2002; Fellbaum et al., 2012; 2014). There is a tripartite symbiosis between leguminous plants, their arbuscular mycorrhizal fungi and their rhizobial bacteria that form nitrogen-fixing nodules on the legume roots. This is an association at the molecular level that is crucial for the nitrogen uptake by legumes. No eukaryotic enzymes can break the triple bond between nitrogen atoms in atmospheric gaseous nitrogen, N2. The reduction of nitrogen to ammonia (nitrogen fixation) is limited to prokaryotes and is catalysed by the enzyme nitrogenase. Most of the nitrogen entering the biosphere (around 100 million metric tonnes of N2 each year) does so through the activity of nitrogenase (the other significant source, lightning, contributes about 10%). Consequently, plants that can form a mutualism with nitrogen-fixing bacteria not only have a significant selective advantage under conditions of limiting nitrogen but also make a major contribution to the availability of reduced-nitrogen in the biosphere. By horizontal gene transfer, the bacteria in the Rhizobium-legume symbiosis have inherited the ability to infect legume roots and form nitrogen-fixing nodules from the tissues of the root. These provide a habitat for the bacteria that is perfectly suited for N2 reduction by providing to the bacteria a supply of carbon (as malate from the plant) and an environment with a low O2 tension (required for nitrogenase activity). Bacteria are housed in specialised intracellular membrane compartments, formed by the host plant, which control the bidirectional exchange of nutrients and, therefore, forms the essential core of the endosymbiosis. Recent studies have demonstrated that the Rhizobium-legume symbiosis makes use of a signalling pathway, receptor, and regulators of exocytotic vesicle trafficking derived from the more ancient arbuscular mycorrhizal symbiosis to form this bacterium-plant symbiotic interface. Furthermore, the beneficial effects of the nitrogen-fixing nodules can be communicated by the mycorrhiza to non-leguminous plants with which it also forms a mycorrhizal symbiosis. For example, inoculating with both arbuscular mycorrhizal fungus and Rhizobium in a soybean/maize intercropping system improved the nitrogen fixation efficiency of soybean and promoted nitrogen transfer from soybean to maize, resulting in yield improvement in this legume/non-legume intercropping system (Ivanov et al., 2012; Downie, 2014; Meng et al., 2015).